The sad truth is that these scenarios impact millions of students across the country, and I hear about it almost weekly. I had a reader who took out $20,000 in student loans to go to dental assistant school, but then had to drop out to take care of her sick mom. At some point in time she wants to go back to school and get her certificate, but that’s not going to happen right now. What’s worse – those student loan payments are still due each month. So what’s a person to do? 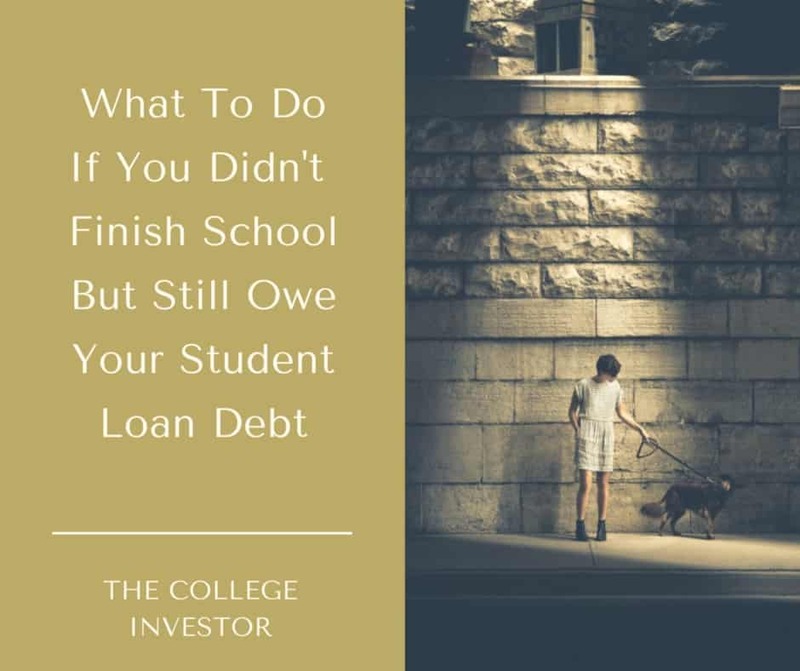 What should you do if you didn’t finish school but still owe your student loans? Here are the steps to go through. Are You Current Or In Default? The first thing to figure out is if you’re current on your student loans or if you’re in default. Sadly, too many people who didn’t graduate and have student loans fall into default before realizing they still owe their student loan debt. If you’re current, you can skip to the next section on picking the right repayment plan for your situation. If you’re in default (meaning you haven’t paid your loans in about 6 months, are getting your wages garnished, or seeing your tax refunds taken), you need to get out of default first. There are a couple different options for getting out of student loan default. We break down the options here: How To Get Out Of Student Loan Default In 5 Easy Steps. Once you’re out of default, you can start making progress on your student loans. The first step is to make sure that you’re on the right repayment plan for your situation. After you leave school (regardless of the reason), you’ll be defaulted into the standard 10-year repayment plan. This plan has equal monthly payments over 10 years. However, you wouldn’t be reading this if you could afford that payment – so you need to change your repayment plan to something more affordable. Most Federal loans allow borrowers to sign up for income-based repayment, which is a set of repayment plans that lowers your monthly payment based on your income. The goal is that you can afford your monthly payments by capping the amount at 10-15% of your monthly discretionary income. It’s very easy to change your repayment plan – you simply call your lender or login to StudentLoans.gov and choose Income Based Repayment on the left sidebar. This is also the number one way that borrowers fall into scams. Before you pay any company for help lowering your monthly payment, read this first. The great thing about income-based repayment is that your payment amount could actually be $0 per month if you don’t earn any income or are below your state’s poverty line. If you left school to take care of yourself or a family member, and don’t work, you can really benefit from this. A lot of borrowers fall into this trap right after they leave school – they defer their loan payments or put their loans into forbearance to avoid paying, rather than changing their repayment plan – typically because they don’t know. However, deferments and forbearance only last so long, meanwhile the loan balance is growing and the situation isn’t getting any better. If you can’t afford your monthly payment, don’t defer then loan. Simply change your repayment plan. This might not be an option right now, but going back and finishing school is a great choice. First, you should continue to work towards your goal of finishing school, even if you encounter roadblocks along the way. Second, if you enroll is school at least half-time (remember this can be college or career-based school), your loans will go back into deferment. Yes, like I said above, deferments only last for so long, but finishing your education is a great reason to defer your student loan debt. Finally, if you just can’t finish school, maybe you can swing going to work. Even better if you can find a job in public service (like early childhood education, emergency services, or even the military). When you go back to work, you can earn money to pay back your loans. But if you take a job in public service, you can also get Public Service Loan Forgiveness, which will forgive your loans after 10 years. Even if you didn’t finish school, this is a valid option for you. The best place to start with help is simply by calling your lender. These companies are paid by the government to help you with your student loan debt. You can hire a third party to help you, but make sure you know what you’re paying for. If you’re not quite sure where to start or what to do, consider hiring a CFA to help you with your student loans. We recommend The Student Loan Planner to help you put together a solid financial plan for your student loan debt. Check out The Student Loan Planner here. If you don’t qualify, refinancing your student debt presents an alternate opportunity to save thousands. Credible enables you to fill out one form and look at personalized offers from multiple lenders in just 2 minutes. As a bonus, College Investor readers who refinance with Credible are eligible for a $200 bonus! Learn more here! Share your story: what are you struggling with if you didn’t finish school and have student loan debt? I knew a few people that had to quit college for family reasons – ill parents and whatnot. It’s sad to see that happen, and I know it’s tough to get started on the degree again after stopping. Working in emergency services is a good suggestion, because those loans are definitely still due! Sometimes dropping out of college is for the best or has to be done for family or health reasons. I always hated hearing of it happening to kids I knew during college, but it did happen. These are good tips! Great advice. There are a lot of people in this situation and it certainly is not an easy place to be in. I knew a few people in college who had to drop out- there is always a level of uncertainty and confusion with it. Thanks for shining some light on the subject! Yes, deferment, forbearance, and PSLF are only eligible for Federal loans. If you have private loans, your best bet is to refinance to lower your payment, or focus on earning more money. Rob, I’m trying to find a company that will consolidate one’s private student loans without a degree. I’ve looked into most of the companies suggested by credible.com and studentloanhero and haven’t found a company that will consolidate private student loans if you didn’t graduate. Can you suggest any companies that offer consolidation without a degree? Here’s our list of Student Loan Refinancing Lenders, so you can compare multiple companies. Another option is to go to your local credit union. Many of them are now offering student loan refinancing, and are much more lenient with their underwriting. My story is different. I took out the loans….EASILY…with the idea of being a rad. tech in the future and being able to pay them. What NO ONE told me is that even if you have all the qualifications and requirements met to get into certain “programs”, that you may not be allowed in. After two years of applying and interviewing for the Radiology program at our community college, I was never allowed to the program. Then I tried and applied to Respiratory therapy with no luck. Applied at a Tech school for Surgical tech. and once again told no. So now I have student loans that I have not been able to pay and would have NEVER taken them out if I had known going to college doesn’t guarantee your allowed to get a degree!! Also, it seems very wrong how easy it was for me to get them. just sign here and get your money. Also, with only one class left for my associates degree, My class was not going to be paid for unless I turned over my tax returns and stuff. I gave them EVERYTHING. It still didn’t satisfy “them”. The college counselor couldn’t even help me figure out what more could be done. So that was the end of that. All the work I had put in for NOTHING but debt. I now run an in-home Daycare and barely live paycheck to paycheck. Its just not right. 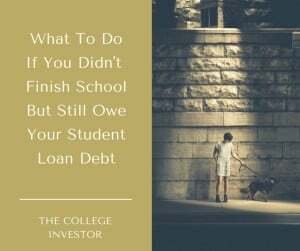 Is there anyway to get your loan forgiven if you only went to school for 2 months and missed the deadline to drop classes? No, that is not a qualifying reason for loan forgiveness. I attended career colleges of America & it got shut down Two years after. I went for medical assistant and I finished the whole course but didn’t finish my internship which was 86 hrs. I couldn’t go back because I had personal problem. I see it unfair that I have to pay back thirteen thousand dollars if I didn’t even get my diploma. What can I do? Try to finish your schooling at another school? Work elsewhere? Is it really unfair? You also didn’t do the work required due to your personal problem. For your loans, you can look into income-driven repayment plans by calling your loan servicer or going online to StudentLoans.gov. I signed up for online classes at hfcc and didn’t start them or get a loan from them why should i have to pay them back and i didn’t go to school. And i also went to dorsey for about a month and had to drop out because of. Health reasons. How did you pay for school if you didn’t get a loan (i.e. the month you went to Dorsey)? Who are you having to pay back – your student loan lender? Do you have any records from your time at either school? I went to Remington college and wasn’t able to make it to class because of transportation problems two months cost 10,000 now they are closed and sold my debt to creditor I’m not paying them can’t something be done about this. You need to get your loans out of default. Read this article: How To Get Your Student Loans Out Of Default. What do schools like Kaplan do with student loan money when someone has to drop out? What do you mean? You paid them for the courses you took. They don’t continue to bill you after you’ve dropped out. I attended the HVAC program at UEI College in Chula Vista California for about two months and had to drop out due to family issues.my daughter was born and my wife needed help at home with the baby and our two older children. I took maternity leave for a month and then my wife’s and I jobs schedules had changed drastically so there was a parent at home with the baby at all times. The program is 10 or 11 months long but I only completed two months. What are my options and what should I do? Is there a way to only pay back what I owe for those two months, or am I stuck paying back the full amount? That’s between you and the school, and what their refund policy is. If they refunded you anything, you should apply it to your loans. If there are no refunds, then you are on the hook for the entire loan.